On Friday afternoon, the Senate State, Veterans and Military Affairs Committee on a 3-2 party-line vote killed a CACI-opposed bill, HB-1392, that would have cost Colorado employers and their two million workers $202.5 million in the State’s coming two fiscal years to subsidize health-care costs for about 140,000 low-income individuals, especially those in rural areas, who face high premiums and costs in the individual health-insurance marketplace. HB-1392 would have asked the Federal Government for approval to establish a reinsurance program to lower health-insurance premiums in the individual marketplace. The Senate sponsors were Senator Don Coram (R-Montrose) and Senator Kerry Donovan (D-Wolcott). The bill had both Democrat and Republican support. In brief, the big question for employers that provide health insurance for two million workers was whether it was fair. Was it fair to workers and employers to pay for the program while the legislature–busy this session figuring out how to spend a $1.3 billion tax revenue windfall–would not put up any money for HB-1392? Under the program, high-dollar claims from $25,000 up to $1 million would have been handed off to the State by the insurers, who then would have been able to lower premium costs for low-income individuals in the individual marketplace. Rural Coloradans who purchase individual health-insurance plans have been especially hard hit by rising premiums and costs. Higher-income people in the individual market and employers and workers who purchase insurance in the small-group and large-group markets would have been subject to the two percent fee on premiums. A provision to levy an 8 percent fee on the “stop-loss” plans of self-insured companies was stricken from the bill in committee. A report by the Colorado Health Institute projects that, under HB-1392, two million working Coloradans would each have had to pay $100 more per year for health insurance while 124,000 would each have had to pay $1,300 less for their health insurance. The bill was opposed by the CACI Governmental Affairs Council and the CACI HealthCare Council. In the House, the bill’s co-sponsors are Representative Chris Kennedy (D-Lakewood)and Representative Bob Rankin (R-Carbondale). Our employers and workers would subsidize individuals who may not even be their own employees. The bill’s second Fiscal Note stated that the objective of the introduced bill was to generate $67.5 million from an assessment of up to two percent on health insurance premiums that would generate another $67.5 million from the Federal Government in fiscal year 2018-2019. The $135 million total would then be paid to health insurers to reduce the “claims cost” of the highest health-insurance premiums paid by Colorado residents. In fiscal year 2019-2020, the numbers would be $135 million from the Colorado premium tax to draw in another $135 million from the Federal Government for a total of $270 million. This bill requires the Commissioner of Insurance to seek a State Innovation Waiver under the federal Affordable Care Act to create a state reinsurance program in Colorado. If federal approval is received, the reinsurance program will apply to 2019 health plans sold on the individual health insurance market. To fund the reinsurance program, the Commissioner is authorized to assess a fee on state-regulated health insurance carriers of up to 2 percent of premiums. In addition, the reinsurance program will be supported by federal funds that would have otherwise been provided to consumers as federal advanced premium tax credits. between 15 and 20 percent in geographic rating areas one, two, and three (Boulder, El Paso, and Teller counties, and the Denver metro area). Fees collected from health insurers and available federal funds under the State Innovation Waiver are to be deposited into the newly created Reinsurance Program Cash Fund. The reinsurance program is created as an enterprise under TABOR and revenue is exempt from the TABOR revenue limits. The Division of Insurance is required to report annually on the reinsurance program as part of the Department of Regulatory Agencies (DORA) SMART Act hearing. Conditional upon federal approval of a State Innovation Waiver, this bill increases state cash fund revenue by $67.5 million in FY 2018-19 and $135.0 million in FY 2019-20. This revenue is from fees assessed on health insurance carriers and is based on the amount necessary to fund the reinsurance program. The first-year impact is prorated to reflect a half year of implementation. The exact fee amount will be determined by the Commissioner of Insurance, but may not exceed 2 percent of premiums collected by health insurers. This revenue is exempt from TABOR revenue limits. “Proposed fee to stabilize Colorado’s individual health-insurance market dies in Senate,” by Ed Sealover, The Denver Business Journal, May 6th. “Health-Reinsurance Bill Would Cost Employers and Workers $270 Million over the Next Two Years,” CACI Capitol Report, April 27th. On Friday afternoon, a Republican-controlled Senate committee on a party-line 3-2 vote killed a House Democrat bill that sought to promote pay equity based on gender for equal work. The bill, HB-1378, died before the Senate State, Veterans and Military Affairs Committee. The measure would have opened employers up to lawsuits in district court while neutering the existing regulatory process for addressing workers’ pay-equity claims. The bill also would have hampered the hiring process for employers by forcing them to publicize all openings and pay ranges. Perhaps the most worrisome aspect of the bill is that it would have allowed a worker to file a lawsuit against a business if her or she believed that the employer was discriminating against him or her in terms of compensation compared to other workers performing the same jobs. This “private right of civil action” provision has always been viewed by CACI as overly punitive. It has often been a provision of anti-employer bills that focus on employer-worker relations. Consequently, CACI’s Labor and Employment Council opposed the measure. The Senate sponsors were Senators Kerry Donovan (Wolcott) and Rhonda Fields (Aurora). The bill was co-sponsored in the House by Representative Jessie Danielson (D-Wheat Ridge) and Representative Janet Buckner (D-Aurora). The bill’s Fiscal Note also contains a summary of the bill. “Once again, Colorado pay-equity measures fail to advance,” by Ed Sealover, The Denver Business Journal,” May 7th. “CACI-Opposed “Pay Equity” Bill Leaps First House Hurdle,” CACI Colorado Capitol Report, April 27th. On last Wednesday, May 2nd, the Senate State, Veterans and Military Affairs Committee killed a CACI-opposed bill, HB-1377, on a party-line 3.2 vote that would have barred employers from discussing prior compensation histories with job applicants. As such, the bill would have allowed a worker to file a lawsuit against a business if he or she believed that the employer had violated the provisions of the bill. This “private right of civil action” provision has always been viewed by CACI as overly punitive. It has often been a provision of House Democrats’ anti-employer bills that focus on employer-worker relations that CACI battles each session. CACI’s Loren Furman testified on April 23rd against HB-1377 before the House Finance Committee. HB-1377 is but one of the package of anti-business bills introduced late in the session by House Democrats that are partisan “messaging” proposals aimed at their party’s liberal base this election year that, in one way or another, seek to close the so-called “income gap” by targeting employers. The bill’s Senate co-sponsors were Senator Kerry Donovan (D-Wolcott) and Senator Dominick Moreno (D-Commerce City). The proposal’s House co-sponsors were Representative James Coleman (D-Denver) and Representative Brittany Pettersen (D-Lakewood). 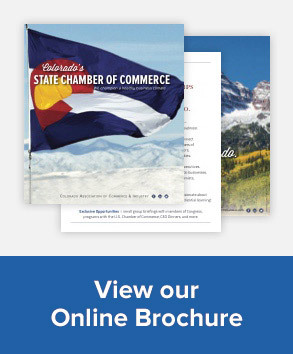 “House Passes Bill to Bar Employers from Discussing Prior Compensation Histories with Job Applicants,” CACI Colorado Capitol Report, April 27th. This morning, the House agreed on a bipartisan 57-8 vote to concur with the slightly Senate-amended version of HB-1400, which sends the bill to Governor John Hickenlooper for his signature. Last November, the Colorado Department of Public Health and Environment (CDPHE) made a presentation to the CACI Energy and Environment Council indicating that it needed an approximate 40 percent increase in air-quality permit fees to meet the needs of the program. Develop a stakeholder process to implement improvements and efficiencies. HB-1400, which was introduced April 18th, is the result of that work. HB-1400 increases the fees by 25 percent and includes a Consumer Price Index (CPI) adjustment each year for the next ten years as well as outlining a stakeholder process to implement improvements and efficiencies. The House co-sponsors are Majority Leader KC Becker (D-Boulder) and Representative Hugh McKean (R-Loveland). The Senate co-sponsors are Senator Ray Scott (R-Grand Junction) and Senator Cheri Jahn (Unaffiliated—Wheat Ridge). The bill’s Fiscal Note contains further analysis and details about HB-1400. For more information about HB-1400, contact Bill Skewes, CACI Contract Lobbyist.